In our first game, Typhoon Thompson, you're called upon to save a baby from Sea Sprites. In Global Commander, you must save the world from nuclear destruction. To top that, in Goldrunner II you must save robot pilots from space pirates. And finally, in Jet, you have only yourself to worry about. Sure, it's tough work but somebody's got to do it. An intergalactic transport has disappeared on a distant ocean planet; only a single baby survives. Three rescue parties have gone after him - and have never been heard from again. Now it's up to Typhoon Thompson, reluctant galactic hero, to save the day. As Typhoon, when you reach the water planet, you'll learn why the previous rescue attempts failed: the Sea Sprites that inhabit the planet doth take kindly to strangers. Not only that, but they're crazy about the baby and don't want you taking him away. tiny bit of humor, either. You're not in this one alone. Spirit Guardians, relics from the planet's long-dead civilization, will provide weapons-as long as you provide the magical artifacts they desire. Each artifact is located inside a Treasury Dome at the center of an island village. All you have to do is zip on over in your jet-sled and retrieve the artifact. Sounds easy doesn't it? There's just one catch: the only way to retrieve the artifact is to capture all the Sea Sprites in a village and trade them for the artifact. That's tougher than it sounds, largely because the Sea Sprites have a penchant for high-tech, beweaponed flying machines and aren't afraid to use them. Some flyers inflict minor damage, others can kill you or destroy your jet-sled. After one of three amusing opening sequences, the Spirits tell Thompson which artifact to retrieve and grant him an additional weapon to use. Now head for the Sea Sprite islands and fire at one of the pods. A direct hit brings one or more flyers from the pod, each manned by an irate Sea Sprite. When you blow up a flyer the Sea Sprite pilot will tread water briefly, at which time you'll have to grab him and stuff him in a sack. If you're too slow the Sprite will head toward a pod, skipping over the water like a flying fish (but you can still capture him if you stun him with your laser cannon). Once you've captured all the Sea Sprites, you go to the Dome, where the Sea Sprite king will emerge, show extreme consternation, then grudgingly give you the artifact you seek in return for his subjects. Return to the Spirits to see which artifact to obtain next. You must retrieve four in all-be happy it's not five! Typhoon Thompson is a great arcade game. Controlling the jet-sled is hard at first and takes some getting used to. When things get hot and heavy you can drop below the surface of the water and catch your breath. Also, you can fire some of your weapons while submerged. Typhoon Thompson has the best arcade animation I've seen-this alone could keep me addicted to the game. As for the Sea Child, well, I haven't rescued him yet, but I'm going to keep trying. In Datasoft's Global Commander, you're the supreme authority of planet Earth. Sounds like a pretty good job, right? Well, it is and it isn't, considering that your main responsibility is to keep the world from getting blown to bits in a nuclear holocaust. This is a task that takes diplomacy, skillful negotiating, bluffing and just plain luck. But make no bones about it, despite Global Commander's morbid premise it's a lot of fun to play. the world"? You get your chance in Global Commander. In the fictional world of Global Commander, Earth consists of 16 nations. Your goals are clear: get along with each nation, help the nations get along with each other, make sure each nation has what it needs and establish military security (There is also the small matter of finding and disarming the World Organization of Terrorists.) Easy, right? To help you in these Herculean tasks, Datasoft has thoughtfully included a map with small stick-on flags so you can keep track of the (current) alliances. Global Commander makes you less a dictator than a moderator, a fact which makes your position tenuous at best. If the nations feel that you're doing a good job, they'll let you continue. Otherwise, they may call for a vote of confidence. If you lose that vote, then you must step down and the game is over. That's one way to lose. The other is to allow a nuclear war to occur. You issue all your orders from your command post, via your control panel. Selecting an option is as simple as clicking on it with the mouse. The first thing to worry about is incoming memos detailing the actions taken by a given nation. You must indicate whether you approve or disapprove of this action or you can ignore it. Your responses to memos tell the nations a lot about you (and your ability to rule the world), so weigh your options carefully. Military security is handled in several ways. If a nation feels insecure, it may actually start a war to head off an attack. To enforce security, you can request that a nation increase or decrease its supply of missiles. Again, they may not comply. But an increased supply of missiles could make the nation feel more secure - or more belligerent. You have three SDI (Strategic Defense Initiative) satellites. These can't protect the whole Earth, so it's up to you to figure out where the next "hot" spots will be and position the satellites to do the most good. You also have access to some sophisticated spy satellites that report on the conditions in the countries the satellites are over. Finally, the services of a powerful, elite commando unit are yours: the UNN Task Force. Wherever you place this unit, that nation tends to behave itself! However you'll want to move it around, since it will be needed in different places from time to time. Also, if you leave it in one country too long that country might start feeling oppressed. You can also use the anti-WOT (World Organization of Terrorists) squad, but only after you figure out where the WOT is hiding. They're a crafty bunch and they'll try to throw you off the track. Once you think you know where they are, you must get permission from the countries to go after them. If permission is granted and you nab the WOT, your prestige and power increase. If you're misled, your prestige takes a nosedive. As the Global Commander, your most important job is to keep track of what's going on. In addition to the spy satellites, you can monitor the radio frequencies. This takes some doing because not only are there six bands, each containing multiple frequencies, but often the transmissions are coded. You have eight filters and you must find the right combination of filters to read the messages as they come in. Fortunately, you'll soon learn where to find important messages from the particularly obstreperous nations and figure out how to decode them. There's also an automatic frequency scan within each band to help you find transmissions. Since Global Commander can take a while to play, you may save games two ways. The more permanent way is to disk, but you can also save them to memory, so that you can go back quickly to a time when radiation wasn't so prevalent! The menu that allows saving a game appears once per week of game time. The graphics, while adequate, are not one of the game's strongest points. This game is definitely for strategists. The challenge is in trying to guess what is going to happen next, in spite of deliberate misinformation, coded radio messages, memos piling up, brush-fire wars and other distractions. I guarantee that you won't win the first few times, but after a while you'll get the feel of this game and will be able to survive for a long time without destroying our favorite planet. You'll learn when to use force - and when to use diplomacy. By the way: good luck. You'll need it. But ruling the world was never so much fun. much fun as the original, but it's a different game altogether. If at first you do succeed-write a sequel. That's what Microdeal did with Goldrunner II, and if you liked the original, you'll like the follow-up. The smooth, outrageously fast scrolling is still there, as are those tall buildings that plaster your ship. It's still as much fun as ever, however, gameplay is quite different. Goldrunner II takes place 50 years after the original Goldrunner. The Ring Worlds have been settled by humans, but man is no longer a warrior. Instead, robot pilots defend against attacks by the pirates-that is, until the robot pilots were captured and held prisoner at some unused space research stations. Your mission is to rescue as many robot pilots as you can. Of course, you must accomplish this mission alone and against impossible odds. 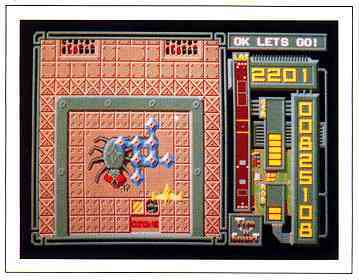 As in the original Goldrunner, you must be extremely careful in Goidrunner II not to destroy your ship by running into the tall buildings that cast long shadows. The robots are in small vehicles that travel on various tracks on the space station and capturing a robot is an involved affair. First, you must use your laser cannons to destroy the vehicle and free the robot. Unfortunately, you can't land to pick it up; instead, you must wait for a green rescue pod to retrieve it. Then you must blast the rescue pod and catch the robot before it is falls to its destruction. Your craft can carry five robots. Once your holds are full, you must bring the robots to a teleport station. Clearing a station of robots, either by capturing them or destroying them, ends that portion of the game. Then a mother ship appears and if you dock successfully, you get bonus points. Either way, you move on to the next space station. The tall buildings make life difficult enough, but they're nothing compared to the enemy forces: the rescue pods, two kinds of fighters (including a large, nasty ship which breaks up into fighters) and mines. Collisions and enemy shells can't hurt you directly, but hits from the enemy make your ship bounce around-and after several hits in succession, you'll find your ship moving at a considerable velocity, making it even tougher to avoid those dad-blasted buildings. in upper levels, enemy forces swarm over you, making life even tougher. Also, tall buildings are much more plentiful in the upper levels. You're not defenseless, though. You have twin wing-mounted laser cannons and occasionally you can pick up a smart bomb. You can control your fighter by mouse, keyboard or joystick, though I recommend the joystick. Your control panel displays a condensed view of the space station, indicating robots, enemy vehicles and your relative position. The graphics and sound in Goldrunner II are excellent. The bright colors and detail of the space stations make the game more interesting while the music track and digitized voice are also well done. Once you get the hang of Goldrunner II, it's very playable. When the included disk of space stations begin to seem too easy, two more data disks with completely different layouts and graphics are available. Data Disk I is a real killer but Disk II is much more playable. Complaints? Yes, a few. For one thing, the right mouse button is used to fire weapons. This is hard to remember, and since the left mouse button fires your smart bomb, you can waste your bombs if you're not careful. Also, nowhere in the documentation or the on-screen pictures are you shown what the teleport looks like! Perhaps this is intentional, but it would help to know what to look for. 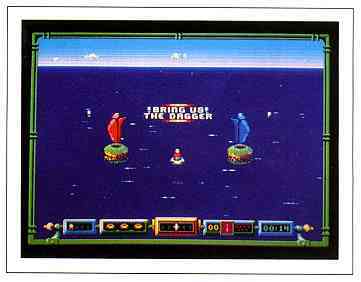 But overall, the exceptional graphics, scrolling and playability of Goldrunner II make it a winner. lf you enjoy shoot-em-ups with a few surprises, I recommend Goidrunner II. your missiles, your only choice is to take him out with your guns. Jet puts you in the cockpit of the Air Forc F-16 Falcon or Navy F-18 Hornet. It's a good flight simulator but it would be much better if its response time were better. However, with the multiple scenarios, you'll never get bored and you can play against friends via modem. Jet gives you all the power of a true simulator and lets you place the screen displays wherever you want them. The first menu lists the 10 simulations available Items 1 to 4 cover the F-16 and items 5 to 7 cover the F-18. Both types of missions include free-flight, target strike and dogfighting. 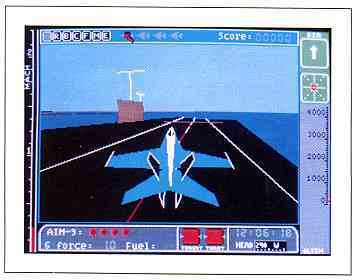 Item 8 loads a Flight Simulator-compatible scenery disk; item 9 lets you connect two ST's through the serial port for two-player dogfighting; and item 0 runs a demo. Your weapons are AIM-9 Sidewinder and AIM-7 Sparrow air-to-air missiles, AGM65 Maverick and MK-82 smart bombs and a nose-mounted machine gun. The Sidewinder is a heat-seeking missile that homes in on the exhaust of an enemy aircraft. Its range is five miles and it's best used for dogfighting. The Sparrow uses radar signals to home in on the enemy. Its range is 25 miles and it's most effective for targets just entering radar range. The bombs are for enemy ground targets. The Maverick, a very accurate bomb with a small blast radius, has a range of 14 miles. It's best used for heavily defended ground targets that you don't want to get too close to. The smart bomb has a larger blast radius but is less accurate, so use it when you require total destruction of your target. The last weapon is the machine gun. If your enemy is closer than the minium range of your missiles, the only option left is to take him out with your guns. F-16 scenarios start from a runway and F-18 scenarios start from an aircraft carrier For F-16 takeoffs, increase throttle head down the runway and pull back on the joystick. For F-18 takeoffs, increase speed to afterburner- two dials will turn red when afterburner is reached - and press Shift-L to be catapulted off the aircraft carriers runway. Once airborne, press function keys 3 and 4 to bring up the map and radar screens, which you'll use to locate enemy targets. Use the range circle at the center of the screen to lock onto air targets and denote targets for your bombs. During a dogfight, the white outlined circle will turn red. The percentage of red denotes the range of the weapon selected. When the circle is completely red, the target is within range. Center the target inside the circle and press the fire button. The missle will do the rest. Using the gun takes more skill in that the rounds fired from the cannon are affected by gravity so sometimes you'll have to fire ahead of your target to counter the G-forces. Landing the F-16 is a breeze. Line up with the runway lower the landing gear reduce airspeed and take her in-the softer the landing the better. The F-18 lands on the deck of an aircraft carrier. Actually, the term "lands" is inaccurate - it's more like a controlled crash! The F-18 has a hook that drops from its fuselage and traps a cable strung across the carrier's deck. As you approach, line up with the deck, reduce your airspeed and drop your gear The most important thing to do is to hit the deck in front of the cable. If done correctly the hook will catch and the jet will stop immediately. Otherwise, increase power and pull back on the stick, or else you'll end up in the ocean. Flying the jets in Jet is difficult, partly be cause it takes about 11/2 seconds before your joystick's input updates the screen. This is unacceptable, especially when dogfighting. SubLogic is known for their realistic scenarios, but when it comes to combat, I don't care how accurate the surroundings are. A wire-frame model would have been adequate and the screen refresh time would have been smoother. But with an increase in screen speed, Jet could be one of the best aircraft simulators ever developed for the Atari ST.
David Plotkin is a chemical engineer for Chevron USA and a frequent contributor to START and Antic. Scot Tumlin is Direct Mail Sales and Support Supervisor for Antic Software. Typhoon Thompson, $34.95. 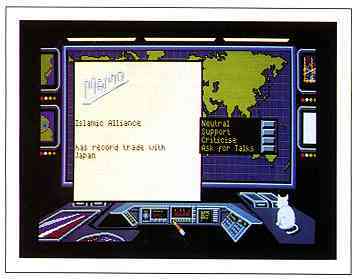 Broderbund Software, Inc., 17 Paul Drive, San Rafael, CA 94903. (800) 527-6263. Global Commander, $39.95. DataSoft, 19808 Nordhoff Place, Chatsworth, CA 91311. (818)886-5922. Jet, $49.95. Sublcgic Corp., 713 Edgebrook Drive, Champaign, IL 61820. (217) 359-8482. Goldrunner II, $39.95. Microdeal (Michtron), 576 S. Telegraph, Pontiac, Ml 48053. (313) 334-8729.